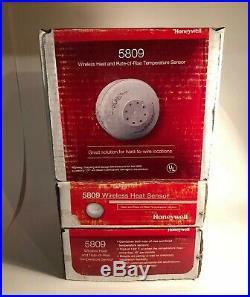 NEW ADEMCO/ADT/HONEYWELL 5809 Wireless Heat & Rate-Of-Rise Temperature Sensor. These are brand-new, but the boxes have been opened. Perfect condition and include manuals/batteries/etc. The item “NEW ADEMCO/ADT/HONEYWELL 5809 Wireless Heat & Rate-Of-Rise Temperature Sensor” is in sale since Friday, February 8, 2019. This item is in the category “Home & Garden\Home Improvement\Home Security\Other Home Security”. The seller is “cobalt-consignment” and is located in Lakeville, Minnesota. This item can be shipped to United States, Canada, United Kingdom, Denmark, Romania, Slovakia, Bulgaria, Czech republic, Finland, Hungary, Latvia, Lithuania, Malta, Estonia, Australia, Greece, Portugal, Cyprus, Slovenia, Japan, China, Sweden, South Korea, Indonesia, Taiwan, Thailand, Belgium, France, Hong Kong, Ireland, Netherlands, Poland, Spain, Italy, Germany, Austria, Bahamas, Israel, Mexico, New Zealand, Philippines, Singapore, Switzerland, Norway, Saudi arabia, Ukraine, United arab emirates, Qatar, Kuwait, Bahrain, Croatia, Malaysia, Brazil, Chile, Colombia, Costa rica, Dominican republic, Panama, Trinidad and tobago, Guatemala, El salvador, Honduras, Jamaica, Viet nam, Uruguay.